Comic Draw, is a full-featured comic creation and publishing application for iPad. Designed with Apple's iPad Pro and Pencil in mind, Comic Draw provides a comprehensive suite of drawing tools, fast and easy script editing and lettering, and an integrated publishing platform in the form of the companion app, Comic Connect. iPad, and especially iPad Pro, is an incredible creative platform ... Now, with Comic Draw, comic artists of all levels can easily create and publish complete multi-page comics right on their iPad. We're excited to see all the new creative potential this will unleash. Drawing in Comic Draw is divided between two separate modes: Sketching and Inking & Coloring. The Sketching interface is distinct and simplified allowing users to focus on creating the simple forms that underlie their final artwork. Once sketching is complete the Inking & Coloring interface brings additional tools and brushes so that the artwork can be refined. Users will find a variety of brushes and color palettes to get them started all of which are customizable. 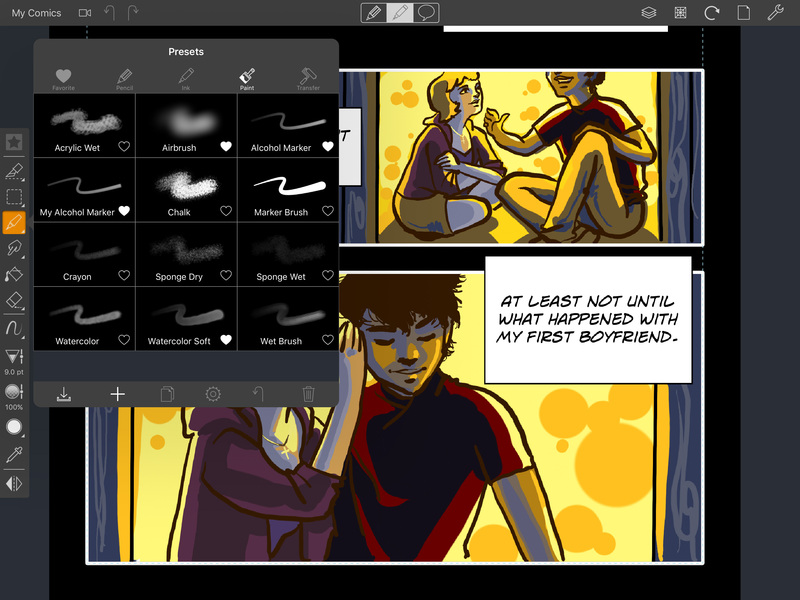 Comic Draw also incorporates advanced features such as blending, masking, filtering, layer groups and multiple perspective guides per page in order to support the most ambitious projects. 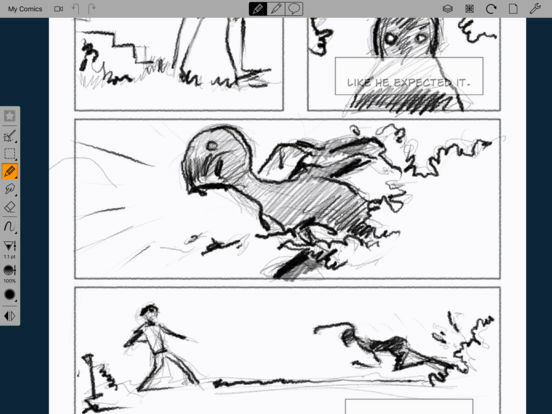 For script-editing and lettering Comic Draw inherits many capabilities from the Apple Design Award-winning Comic Life. Users can refine their story in the script editor, outlining ideas for panels and character dialogue. When lettering, text from the script can easily be dragged and dropped onto the comic pages. A comprehensive style system allows for easy and consistent typography and graphic design. Balloons and their associated tails can be positioned and reshaped as needed, while lettering can be warped for dramatic effect. The lettering elements can also be previewed while sketching ensuring that the entire page will work together before final artwork commences. 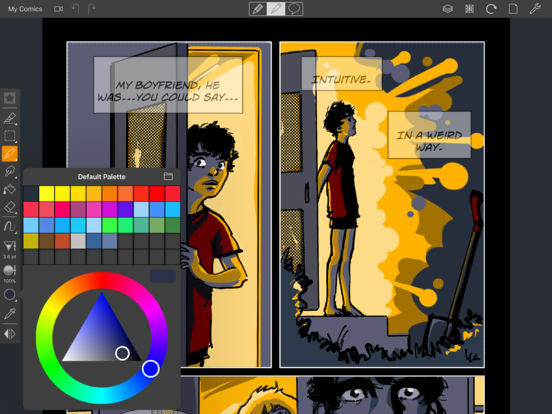 When the comic is complete users have the option of publishing their creation to Comic Draw's free companion application Comic Connect. Users of Comic Connect can follow their favorite artists and get notifications when new comics are available. The integrated reader presents comics with a natural page turning interface. Users can discover new comic artists, check out the featured comics, and creators can follow their rankings on the charts. Comic Draw and Comic Connect are available from the iTunes App Store. Comic Draw is free to download and all features can be tried for 14 days via a free In-App Purchase. While the regular price will be $19.99 USD to retain access to all the comic creation, editing and publishing features, an introductory 50% (USD $9.99) discount is available during the first month of release. (Offer ends Feb 22nd 2017). Comic Connect is a free download. Charleston, South Carolina - plasq is a loosely coupled collective of computer enthusiasts from around the world joined by a love of great software and the desire to unleash the tremendous potential of today's computer systems. Copyright (C) 2017 plasq LLC. All Rights Reserved. Apple, the Apple logo, Mac OS X, iPhone, iPad, iPod and Macintosh are registered trademarks of Apple Inc. in the U.S. and/or other countries.